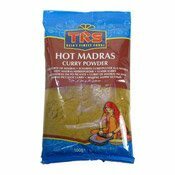 TRS Hot Madras Curry Powder is an aromatic blend of spices, specially imported from Madras and ready to use, for all authentic Indian curry dishes. To retain freshness and flavour, store in an airtight container, in a cool dry place. Ingredients: Coriander, Turmeric, Chilli, Mustard, Cumin, Pepper, Fenugreek, Garlic, Salt, Fennel. Simply enter your details below and we will send you an e-mail when “Hot Madras Curry Powder (馬德士辣咖喱粉)” is back in stock!